“You’re going to meet Miss Atlantis, the daring young lady who will defy the devil and swim with three killer sharks,” says Brooklyn artist and performer Richard Eagan, recalling his spiel as an outside talker for the Florida Shark Show. His 1987 gig managing the Coney Island attraction is among the midway experiences that he relives in “Alive on the Inside,” on Thursday, January 28th at City Lore. Among the characters Eagan brings to life in the show are Buddy Cook, who is actually Norman Kaufman, owner of the Jumbo Jet coaster, whose Stillwell Avenue amusement park was evicted by Thor Equities in 2006 to make way for “redevelopment.” “I refer to him as ‘The Buddha of the ticketbox,'” says Eagan. Ronnie D is Ronnie Guerrero, the late owner of 12th Street’s famed Polar Express, which was located on Stillwell Avenue in the 1980s. Jake Fein is concessionaire Jack Merr, who operated a basketball game across from the Spookhouse. Eagan co-founded the Coney Island Hysterical Society with fellow artist Philomena Marano in 1981 because they were “hysterical” at the rate that the amusement rides and attractions were shutting down. One of their projects was the transformation of the disused Dragon’s Cave ride on the Bowery into the Spookhouse, which they operated until 1984. Their visual art is on view in the exhibit “Boardwalk Renaissance: How the Arts Saved Coney Island,” at City Lore Gallery through March 13. 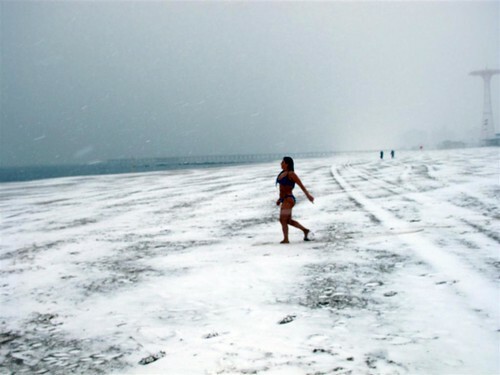 After weeks of balmy winter weather, members of the Coney Island Polar Bear Club are ready for their first snow swim of the season on Sunday at 1:00pm. Several Bears plan to meet for an unofficial blizzard dip at Stillwell Avenue on Saturday at 12 noon during the storm. Snow swims during or just after a storm are a Polar Bear tradition. These photos were taken by Coney Island photographer and Polar Bear Bruce Handy last year and in 2010. Coney Island drew an astounding total of more than 28,000 visitors to its new New Year’s Eve Celebration and long-established New Year’s Day Polar Bear Plunge. The district’s City Councilman Mark Treyger tweeted the official tally that “Over 15,000 people turned out to celebrate New Year’s Eve in Coney Island!” Temps in the 40s and the promise of free rides, sideshow performances and fireworks helped triple attendance for the New Year’s Eve Party at the Parachute Jump, which was started by Brooklyn Borough President Eric Adams and is in its second year. The free, family friendly celebration was sponsored by the Borough President along with Councilman Treyger and the Alliance for Coney Island. 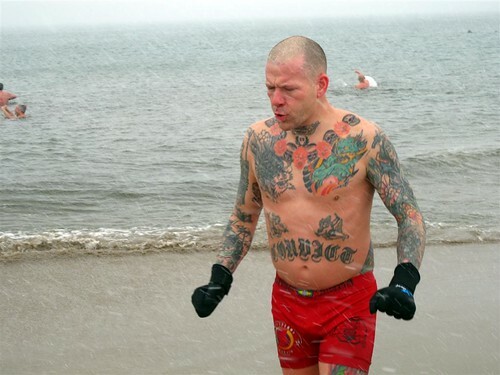 On New Year’s Day, the Parks Department estimated there were 10,000 spectators at the Coney Island Polar Bear Plunge. “We had almost 3,000 swimmers participate in the plunge this year,” Polar Bear Club president Dennis Thomas tells ATZ. “I am sure it is a record. The past few years we have been averaging a little over 2,000 swimmers.” What’s more, the funds raised by the Polar Bears for Camp Sunshine have far exceeded their goal of last year’s total of $70K. Nearly $90K has been received so far, with donations still being accepted here. If the trend continues, next year the Bears could break $100K for the camp, which hosts children with life-threatening illnesses and their families. The novelty of major rides –the Wonder Wheel, B&B Carousell and Thunderbolt roller coaster– being open on New Year’s Eve and offering a free spin was a big draw. When we got here around 8:30pm, the atmosphere was festive but the crowd was still sparse, evoking memories of the first years of the Mermaid Parade, before it grew into the world’s largest art parade. 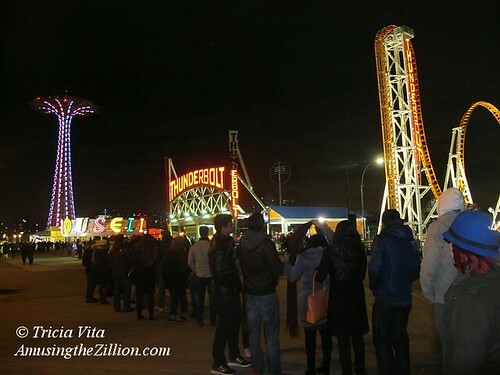 Around 11:15, the vast majority of revelers began to arrive and gather around the dazzlingly lit Parachute Jump, Brooklyn’s Eiffel Tower, for Coney’s countdown to 2016. Deno’s Wonder Wheel’s white cars rode approximately 2,000 people for free on New Year’s Eve, with the line snaking towards the boardwalk. On New Year’s Day, just over 500 tickets at $5 per ride were sold, with 50% of the proceeds — $1262.50 — donated to the Polar Bears’ charity Camp Sunshine. Over 400 cups of hot chocolate were handed out to guests. Will winter rides become an annual tradition? That depends: Coney’s outdoor rides operate “weather permitting,” and luckily this year’s weather permitted the first-ever New Year’s spin. Happy New Year to and from Coney Island! Stay tuned for a photo album of some of the best pix of this year’s plunge. For the first time in decades, Coney Island will offer a glittering array of parties on New Year’s Eve and for the first time in the winter, weather permitting, a trio of major rides –The Wonder Wheel, B&B Carousell and Thunderbolt roller coaster–will be awhirl. These additions to Coney’s entertainment calendar coincide with the trailblazing New Year’s Eve celebration started last year by Brooklyn Borough President Eric Adams and now in its second year. On New Year’s Day, the annual Polar Bear Plunge into the not quite as icy as usual Atlantic-the water temp was only 51 on Christmas Day- is likely to draw more participants than ever, and will be accompanied by the traditional parties at Ruby’s Bar and Peggy O’Neill’s and the first spin of 2016 on Deno’s Wonder Wheel and the Eldorado Bumper Cars. The fun begins this New Year’s Eve at 9:00pm with music and giveaways at Brooklyn’s Eiffel Tower, the Parachute Jump, located on the boardwalk just west of 16th Street. After performances by Coney Island USA’s Circus Sideshow, you can ring in the New Year watching the Parachute Jump’s dazzling display of 8000 LEDs featuring a digital “ball drop” at midnight and fireworks shot off from the beach. The free, family friendly celebration is sponsored by the Borough President along with Coney Island’s City Councilman Mark Treyger and the Alliance for Coney Island. Kicking off the countdown to its 100th anniversary in 2020, Deno’s Wonder Wheel will spin for the first-time in its 95-year history on New Year’s, including free rides on New Year’s Eve from 9:00-11:00pm. The antique B&B Carousell, which until about 15 years ago was open year round, and the new Thunderbolt roller coaster will spin on New Year’s Eve for free from 8:00-11:00pm. Abe Stark, an indoor skating rink on the Boardwalk, will offer free ice skating from 7:00-11:00pm. There will be free parking at MCU parking lot. Among the Coney Island venues holding ticketed events on New Year’s Eve are Eldorado Auto Skooters, Coney Island USA, Coney Island Brewery and Gargiulo’s. A number of local bars and eateries will be open for New Year’s Eve with their regular menus and offering extended hours. Tom’s Coney Island, the Boardwalk outpost of the Prospect Park eatery, which has a full bar, will be serving till at least 12:30am. The original Nathan’s Famous on Surf Avenue will be open till 1:00am, as will Wahlburger’s, the celebrity eatery across the street. Surf Avenue restaurants with bars keeping later hours–till at least 1:00am include Peggy O’Neill’s (1904 Surf Avenue), Footprints (1521 Surf Avenue) and Applebee’s (1217 Surf Avenue), which is offering a free champagne toast at midnight. Grimaldi’s Pizzeria (1215 Surf Avenue) is open for a prix fixe dinner of pizza, appetizer, drinks and a glass of champagne for $30 per person. All will be open again for New Year’s Day. if you plan to join the annual January 1st Polar Bear Plunge, it is at 1:00pm sharp, with on-site registration from 10:00am, the same hour when Ruby’s Bar opens for libations on New Year’s Day. Did you know the Bears’ hugely popular swim is also a fundraiser for Camp Sunshine, where children with life-threatening illnesses and their families can enjoy a summer vacation? You can save time with online registration and make a suggested $20 pledge for this year’s Plunge or help teams like The Ice Warriors, Never Too Cold for the Bold, and the Empire Strikes Coney meet their fundraising goals. Last year, the club raised over $70,000 for the camp and hopes to exceed that amount this year. On January 1st, the New York Aquarium is offering free admission to all registered Polar Bear Plungers with a wristband (10:00am-4:30pm). It will cost $5 to ride the Wonder Wheel, which will be open from 11am to 2pm, and is donating 50% of the proceeds to the Polar Bear Club’s fundraiser for Camp Sunshine. The Coney Island History Project will have interviewers at the Wheel recording New Year’s messages for their Oral History Project. On West 12th Street, “Miss Coney Island,” the legendary dancing doll whose twin mottoes are “25¢ to Fall in Love” and “Don’t Postpone Joy,” will be open on New Year’s Day, along with the animated amusement park “Coney Island Always” (25 cents). Also on New Year’s Day, the Eldorado Auto Skooter will be open for the first ride of 2016 ($7.00 per ride) and the Coney Island Circus Sideshow will be performing from 2:00pm-6:00pm ($10 for adults, $5 for kids). Miss Coney Island, the legendary dancing doll whose twin mottoes are “25¢ to Fall in Love” and “Don’t Postpone Joy,” will be open on New Year’s Day. Join her and her dancing cats– the cost of a dance will remain at 25 cents in 2016. She wants to show off her sweet new skirt, which her dresser did not get around to putting on till after the season was over. A favorite tape featuring reggae versions of Auld Lang Syne and Christmas carols will be played. 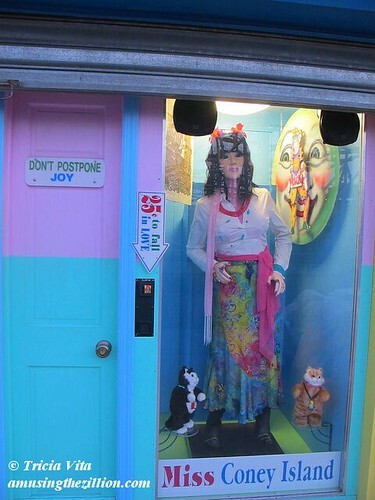 The doll and the cats are located on West 12th Street, under the Wonder Wheel, which will also be open for the first time ever on New Year’s, weather permitting. Originally a circa 1935 Indian Princess at the Danbury Fair, the doll was bought at auction when the fair closed and soon underwent a sea change into Miss Coney Island. Father Time has been kind to her. 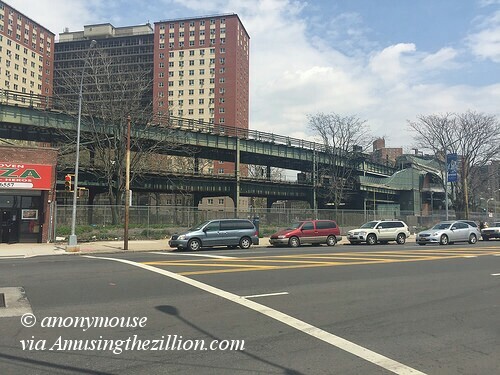 Though you’d never guess it to look at Miss Coney, she is over 80, just ten years younger than Deno’s Wonder Wheel Park’s mechanical fortuneteller, Grandma’s Predictions.